Uma by Como is located at the far western end of the lush Punakha Valley, less than a five hour drive from Paro, this intimate luxury lodge is part of the landscape, nestled on a hillside overlooking a snake like bend in the Mo Chu River; Uma Punakha is ideally located for those wishing to explore this remote Himalayan Kingdom. 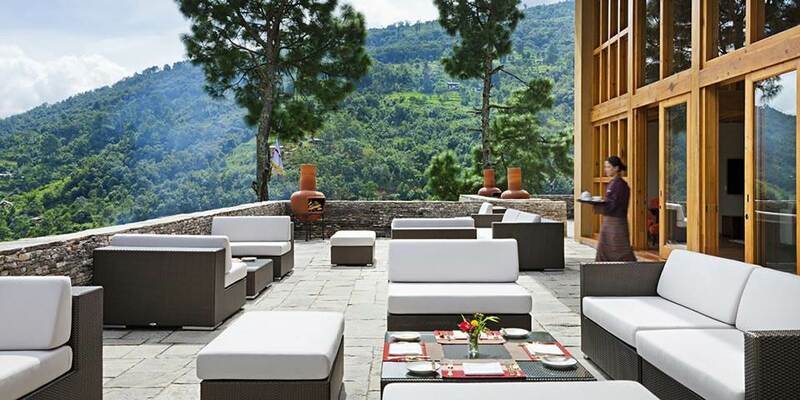 Authentic Bhutan cuisine is a fundamental element of the experience at Uma by COMO, Punakha. The Bukhari restaurant is named after the traditional Bhutanese fireplace, here seasonal menus take a contemporary approach to traditional national dishes, using local produce and ingredients, many of them sourced from the neighbouring organic farms and gardens, with a selection of international dishes offered alongside. Guests can also enjoy the healthy and revitalising COMO Shambhala juice menu, devised by nutritionists to give a restorative shot of energy after an active day exploring. The location of Uma Punakha offers guests exceptional access to some of Bhutan’s most celebrated landscapes and historic sites, including the famous Temple of the Divine Madman and the imposing Punakha Dzong all of which can be seen on journeys taken with professional English-speaking guides. Also on the adventure menu and on the doorstep are customised hiking, biking and overnight camping. 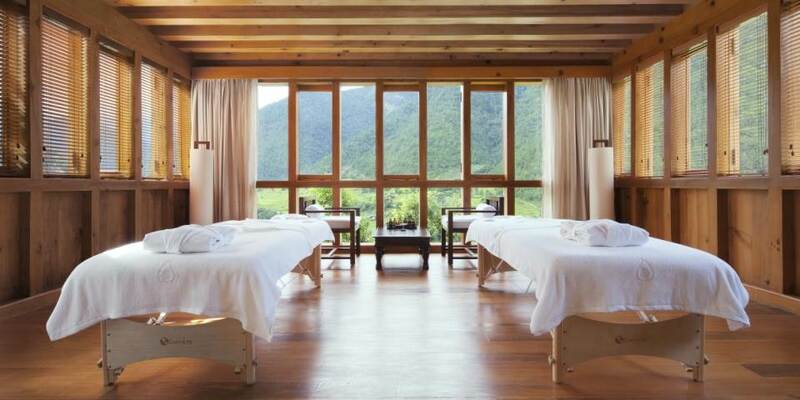 The Como Shambala Retreat, with spectacular river views, is there to nurture mind body and spirit with yoga and a range of holistic Asian inspired treatments. 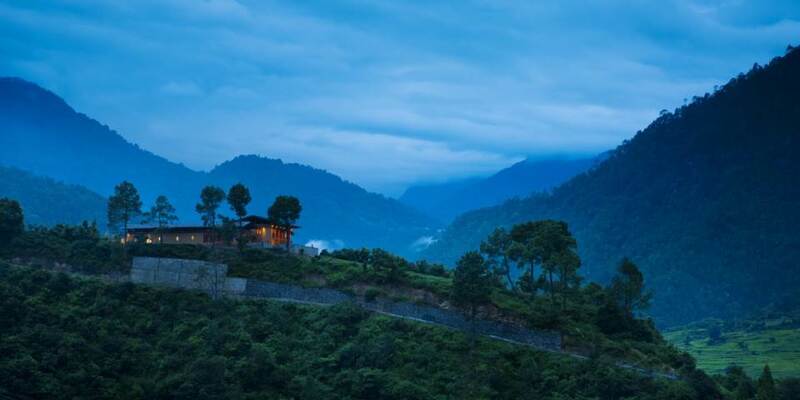 A stay at Uma by Como Punakha is about being encouraged to relax completely while also immersing in Bhutan’s magical culture. Those seeking more than just luxury will not be disappointed. 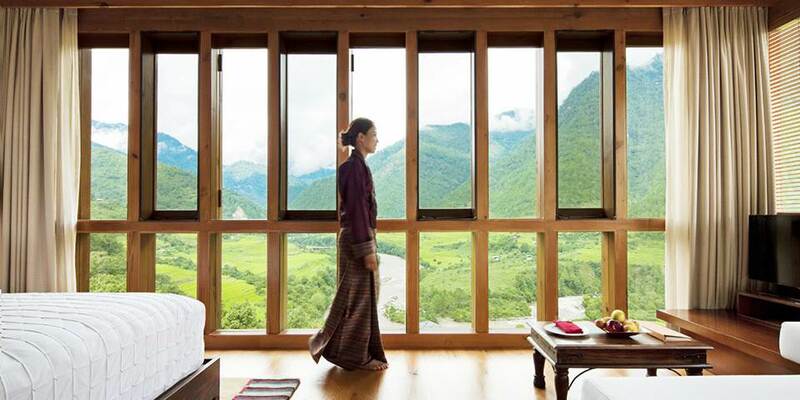 Among luxury hotels in Bhutan, few have rooms with views like those of the 9 Valley View rooms here. They are light, airy with bright wall paintings by local artisans and have space for a comfortable lounge area; some even have an outdoor terrace. Two villas - a two-bedroom COMO Villa ideal for families and a One-Bedroom Villa perfect for couples - provide not just privacy but soul-stirring views of the forest, mountains and the surrounding valley. 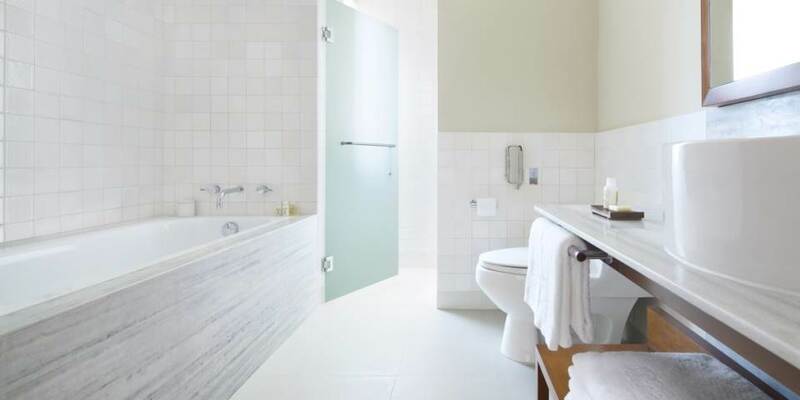 The one bedroom villa is an elegant, stand-alone house with a separate living room dressing room and bathroom; in the bedroom French windows open up to the beautiful valley view below. Outside, the villa has its own glade, where rhododendrons and hydrangeas frame the view from your terrace. From the bathtub, there are more dramatic Punakha Valley views. The luxury two-bedroom Como villa has a large living and dining area opening on to a panoramic sweep of the Punakha Valley. Two double bedrooms flank each side, affording dramatic views and privacy, including from the large outdoor terrace. Interiors brim with Bhutanese design details and understated comfort. In the bedrooms, luxurious Indian cotton bedcovers have hand-stitched patterns paying homage to Bhutan’s Buddhist culture and colours, while hand-knotted rugs come from nearby Nepal. The COMO Villa also sits within its own glade planted with azaleas, rhododendrons, camellias and hydrangeas.